If Slash hadn't put all his heart and soul into music and becoming one of the world's greatest rock guitarists, perhaps he would've sought a career in zoology? He is a trustee of the private, non-profit Greater Los Angeles Zoo Association (GLAZA) and earlier this year shot a commercial for Los Angeles Zoo and Botanical Gardens with veteran actress Betty White to promote the new exhibit The Lair, which displays over 60 species of weird, rare and endangered amphibians, invertebrates and reptiles. He has shot other ads and PSAs before for the zoo. "I used to not believe in zoos as a concept, but now because there are so many endangered animals; there's so much poaching," Slash tells Samaritanmag. "With zoos now, it's really about conservation. They become safe houses for a lot of species so, I think, now, zoos are really necessary places, not totally about just family entertainment at any cost. It's about education; it's about conservation." Anyone familiar with Guns N' Roses, Slash's former band, knows he used to own snakes -- as many as 80, which he got rid of when he became a father. He has been on the cover of Reptiles magazine and even had a band called Slash's Snakepit post GNR. But he's actually a lover of all animals. 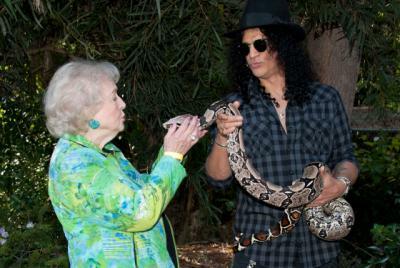 Slash has been visiting the LA Zoo since the age of 5 and later in childhood went every weekend, sometimes twice. As a touring musician, he often visits the local zoos on his downtime. "I've been to every zoo and natural history museum in every country I've been into," Slash told Samaritanmag when he was in Toronto to promote his new album, Apocalyptic Love, out today (May 22). "This zoo is killer," he says of the Toronto Zoo. Last summer, Slash received the inaugural Tom F. Mankiewicz Leadership Award from GLAZA at the 41st Annual Beastly Ball recognizing his longtime support of the zoo and the welfare of the world's natural and civic environment (filmmaker Mankiewicz was GLAZA chairman who died in 2010). "I just try to help the zoo," says Slash of his role as a trustee. "We all on the board support and help the zoo's best interests. We just try to keep all that together. It's a pretty big thing. It's a city-owned zoo and we're trying to make it a private zoo and there's just always something going on with that."